Lost in time, lost in space, and meaning. Here’s something you haven’t seen since last May: new Dragon Comics! When we last left our heroes, they were on a mystical, if peripatetic, journey. And I wrote a 2-week story arc for this part of the journey last spring and never got around to drawing it because I was drawing something else 25 hours a week and that was all the drawing my thumb could take. But now I have some time I’ll probably get this comic to some sort of plateau. Truth be told, Dragon Comics aren’t what they used to be. Not only can I draw much more impressive webcomics than I could when I started this strip, so much about the relationships in the comics has changed. The Missesses Kitty are divorced, the Fox and the Otter are married and they have a Wolf-Deer in the mix. The Man and I are still on a mystical journey, but a lot changes in 3 years. I don’t know if I should think of a new iteration for the comic, or just move on to another kind of story. My friends have always liked this comic, but the rest of the internet seems more impressed by the other comics I draw. Still, there’s a bit more of this story to tell, at least. Maybe it’s a good idea to keep it in reserve for when the plot needs to get a bit more metaphorical than comic. This entry was posted in dragon comics and tagged comedy, companion, dragon, mystical journey, solitude, The Man, travel on September 5, 2017 by littledragonblue. I keep all my cephalopods hidden away from prying eyes. Giant octopuses are only the first layer of weirdness. In this direction, at least. That’s why it’s fun to take the roundabout rout: so you can catalog the anomalies you might otherwise miss. There’s a lot of accounting to do in here. This entry was posted in dragon comics and tagged journey, mystical journey, octopus, strange hidden, travel, weird on April 28, 2017 by littledragonblue. They mostly just eat toast anyway. Sometimes the journey inward is the scariest one of all. If there are things you’ve hidden from yourself, you can guarantee figuring them out will be an unpleasant experience. Speaking of unpleasant experiences, today I got a cortisone shot in my hand. The PA told me I probably shouldn’t draw tonight but obviously there’s no helping me. We’ll see. This entry was posted in dragon comics and tagged comic, dragon, journey, travel, webcomic on April 21, 2017 by littledragonblue. If you look at them too closely, flowers are really obscene. Wow! I survived this weekend. Tomorrow, my feet will hurt, but walking in the All Souls Procession is always worth it. This week I will finish the Portage Printing comic and create my holiday bulletin board and then next weekend is my birthday celebration with Tucson friends, since I won’t be in Tucson on my actual birthday. It works out like that a lot, if I go to my parents’ for Thanksgiving. However, this will be my very last Chicago Thanksgiving, since the folks are finally retiring, and I will never again have to freeze myself in the Windy City in order to spend time with my family. Most likely I will again have to spend 6 hours stranded in O’hare because the weather is awful, but at least I won’t have to go outside. I mean, I like Chicago. Between May and September. Back to the Portage Printing comic. The last page is the easiest for layout, but is taking forever due to the fact that I started it in a style that involved drawing really realistic versions of pieces of audio-visual equipment, and page 3 involved 3 large old-fashioned televisions. But the TVs are almost done, and the images of what’s being shown on the TVs should be much easier. This entry was posted in Uncategorized and tagged celebration, flowers, mandala, travel on November 7, 2016 by littledragonblue. I didn’t leave it in the window. It started out this pale. Sunday night as I write this, and I already have scripts for 3 days’ worth of comics, plus a couple cool macros. As The Man and I have another exciting adventure coming up this week (2 more days of airline travel…I shudder to think) and if I can’t get a couple days ahead, I’ll probably accidentally miss half a week like I did the last time I had to endure the tender mercies of the airline industry. Tonight we counted and I have 900 of my 1000 cranes, which is also exciting. I’m completely out of origami paper, and everyone in town seems to be out of it, which is frustrating, but with only 100 to go, I’ll probably start cutting squares out of random pages. OK, back to Tuesday’s comic, and maybe Wednesday’s if my brain can stay on that long. This entry was posted in mandala, Uncategorized and tagged art, mandala, origami, travel on April 18, 2016 by littledragonblue. If I were a better artist, I would be uploading a funny comic right now. The Rabbit and I, after a long journey that involved treacherous mountain passes, unpaved country lanes, and, no joke, an actual living, breathing BLACK BEAR standing in the middle of the freaking road, made it to the very isolated Z Lazy B Ranch, where there is no cell phone service and no accessible wifi. Since I rely heavily on existing images when I draw, and since I sometimes needs to do more research to make a joke work, even though I had an idea for a comic, I didn’t have the materials available to actually create that comic. Anyway, the above image really communicates the general sense of where we are. We are staying in a cabin identical to the one in the picture (ours is next door). 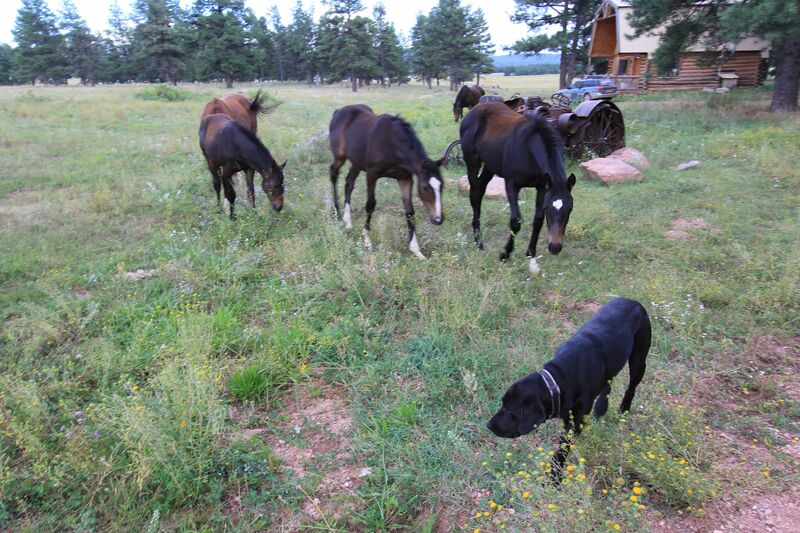 These horses come by every evening, chomping clover, and don’t seem to mind us petting them. The dog comes over every day and just hangs out. We took a long, rambling walk on Tuesday and she stayed near me the whole way. Even when she went after a jackrabbit, she came back to me. I imagine it must be incredibly boring for her when it’s not hunting season. Even though the Rabbit told me that labs don’t point, I swear this one kept pointing. I kept telling her I didn’t do that kind of shooting. I only wrote 2100 words, which is not really that impressive, but, after we get some supplies for the Rabbit, I hope to write at least 3000 tonight, and maybe draw a comic. It’s possible that we’ll have enough wifi at some point for me to post it for Friday. This entry was posted in art life and tagged animals, land, travel, writing on August 13, 2015 by littledragonblue.